The Apron is an essential piece of work wear for waiters and waitresses in a range of cafe, restaurant and bar settings. Our cafe aprons come in a range of different styles and colours with different practical advantages, so here’s our guide to what we can offer to suit your needs. Just one of many styles, our Bistro Apron reflecting the classic bistro style, comes in a long style and has a handy pocket and pen slot on the waist and self-fabric ties round the back, providing an elegant and functional solution to for your waiting staff. For more useful storage on the go, our three pocket apron is a much shorter style, features three open pockets and again is self-tied with fabric ties at the back. It is also available in a wide range of colours to match your bar or cafe. This includes everything from bottle green to emerald, fuchsia and hot pink. For a much longer option, our 86cm long bib aprons also come in a range of colours, and are full length with fabric neck and back ties and a sliding adjustable buckle. The bib apron again comes with a large central pocket for hands free work. Also full length, our long length pocket tabard is adjustable and comes in a variety of colour options. 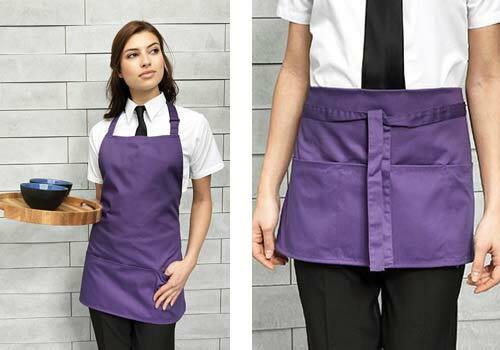 With a central pocket and a crease resistant finish it makes for a presentable and practical option for waiting staff, also offering complete protection of clothing from spills. Much shorter is the waist apron, this bar apron comes in either black or white, and includes three open front pockets. Again, a crease resistant finish offers a smartly presented, durable and highly practical garment. Like most of our aprons, the waist apron is 65% Polyester and 35% Cotton Twill for hardy and comfortable fabric and has a 245 gram per square metre weight. For those who need to outfit their kitchen staff as well as their waiters and waitresses, we’ve got some great options for you too. Our Chef’s Stripe Apron features butchers style fine stripes and is 100% cotton for a soft finish to the touch. For a shorter option for your chefs, our Gastronomy waist apron also has a traditional striped option and features a more modern slightly tapered cut. Available in black or grey, or fine stripes this is a very practical and versatile garment, ideal for your kitchen team.